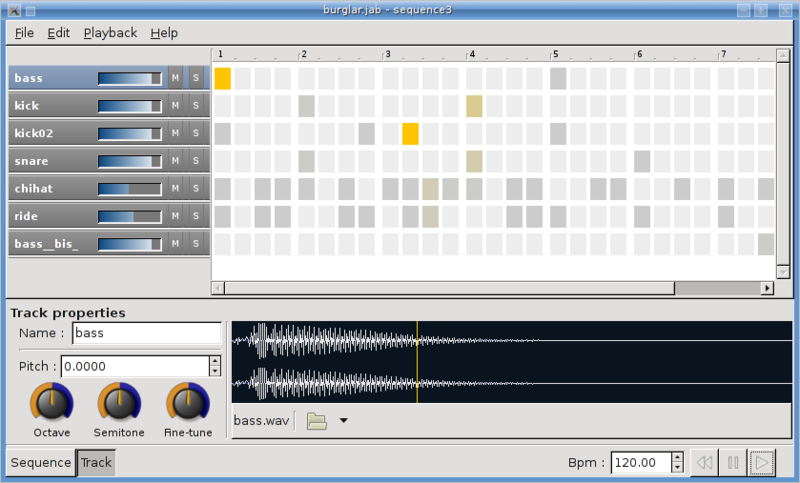 Jackbeat is a free audio sequencer for Linux, OS X and Windows. Its interface is quite simple and intuitive, as already seen in other drum machine. Yes, because Jackbeat born as a drum machine, as you can guess from the interface. But the peculiarity of this instrument is to be interfaced with other software and virtual instruments thanks to the implementation of the JACK system, which in part contributes to the name of the software. Jackbeat is particularly easy to use because it has a very intuitive interface that meets the needs of the live setup of the composition or in the studio. An illustrative picture of the intuitive Jackbeat’s GUI. The use of this instrument is based on an extremely popular model, structured with virtual buttons that identify the timing of each beat. On the left is listed every single sample loaded, while in the bottom is visible for each of them the spectrogram. Jackbeat allows you to export your work in Wave format, allowing you to use it with other external software. Jackbeat is available for free and can be downloaded at the following address, which is valid for all operating systems. Here you can find additional information material.